Bonnaroo Fashion “Do’s” Pt. 2 — Ice, Ice Baby! One thing anyone who has been to the Bonnaroo Music & Arts Festival can tell you is this: it’s hot (no, not like Paris Hilton saying that something is hot, physically hot like a grilled cheese sammich that is still grillin’). Desperate circumstances call for desperate measures, and when you’ve gotta cool down you’ve gotta go for frozen water cubes. That’s right: it’s Reddy-Ice Time. This guy’s choice to strip right down to shorts and hang the Reddy-Ice bag over his head shows a sense of style and fashion that is also affordable. 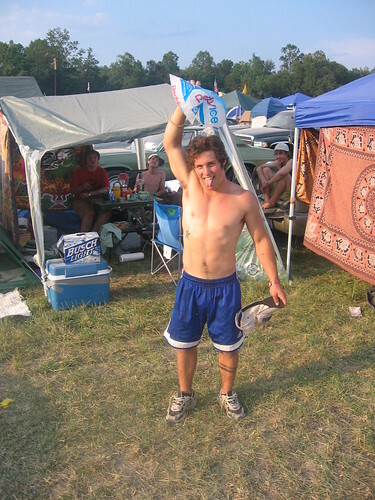 Of course, be prepared: a single bag of Reddy-Ice at Bonnaroo will set you back $3.50. But hey! That’s the price you’ve gotta pay for keeping it cool in the dreaded summer heat.